Organizing your cash flow is integral to retail success, and your PayGo software puts all of your sales and cash information in one easy place! 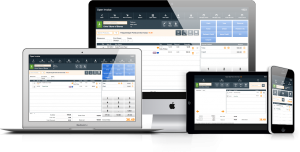 This article will help you get oriented with your tills screen’s functions and reports. You can access your tills screens on your central Sales screen, accessed via the menu. This will take you to the Tills Screen. Note: if you have not created a till for the day, you will be prompted to do so before viewing the Tills Screen. Follow the prompts to create a new till. For more information on creating tills, see Starting a New Till on Your Workstation. On your Tills Screen, you will see information for your current till. Along the top of the screen, you will see several buttons. Back: This will take you back to your central Sales screen. Payment Detail: clicking this will generate a report detailing the payments taken on this till. When this button is clicked, you will be asked if you would like to print the report as either a full page or receipt. When your printer type has been selected, a Report screen will be opened for you to view the payment detail report. Note: If you do not want to print out the report, select Full Page printing. This will open a printing preview and you will be able to exit out of the Report screen when you’re finished viewing. Till Totals: Clicking this button will prompt a printout of your current till totals. Sales Journal: This button will open a search box where you can search for a sales report by whatever parameters – for instance, by dates, departments, or customers – you would like to view. Daily Summary: Clicking this will allow you to open a Report screen which will allow you to view a summary of the day’s sales. Till Summary: This will open a Report screen which will allow you to view a summary of the till’s current totals. Open Drawer: Clicking this button will open the cash drawer. Petty Cash: This button will allow you to record a cash drop. Clicking this button will open a pop-up window where you can enter the amount of the cash drop. The cash drop will then be recorded on the Till Closing Screen. Safe Drop: This button will allow you to record a safe drop. Clicking this button will open a pop-up window where you can enter the amount of the safe drop. The safe drop will then be recorded on the Till Closing Screen. Post Till: This will post and close out the current till. For more on closing out your till, see Closing Out a Till. Till ID: This is the name of your current till. The name for your till is set when you start your till for the day. Note: You cannot reuse a previously utilized till name. PayGo recommends you use a name and the current date for your till IDs. Currency or Payment Method: This is where you can view totals for each payment method that your store accepts. You can add, edit or remove currency methods in your company settings. To access this, click Settings & Options button on your Menu Screen, and then clicking the Company button on the sub-menu. Within the Company Setup Screen, click the Currency Setup tab. Select which payment types you accept, click the X under the Pmt (payment) Method column. PayGo Till Totals: This will be where all recorded payments you have received from your sales for this till will be listed. These numbers are automatically generated and cannot be edited. Your Counted Till Totals: This is where you can enter the value of each currency method you have received from your sales for this till after the totals for each have been counted. Starting Amount: This is where you can enter the amounts for each payment method this till will be starting the day with. Typically, you will only start the till with a Cash balance, so all payment methods except for cash will be left blank. Note: Your PayGo software allows you to set a default starting till balance in your Workstation Settings. Difference: This will be where you can see the difference between PayGo’s till totals and your counted till totals. These numbers are automatically generated and cannot be edited. Pencil Icon: clicking this icon will open the Till Worksheet screen. on this screen, you can count out the number of each individual coin and bill you have in in your till, and it will be automatically added for you and entered into the Your Counted Till Totals field. Create Date: This is the date the till was created.